Although the first Android-powered BlackBerry handset still has to be announced, the company already teamed up with Google, unveiling they are working "to set new standards in enterprise mobile security." As data protection becomes more important for smartphones with each day, Google and BlackBerry form a partnership that aims to "bring Android to work." XDA Developers discovered that the company recently purchased two domains, namely AndroidSecured.com and AndroidSecured.net. While the last one currently does not contain anything and does not redirect anywhere either, the first redirects to a page on blackberry.com that contains some interesting information. 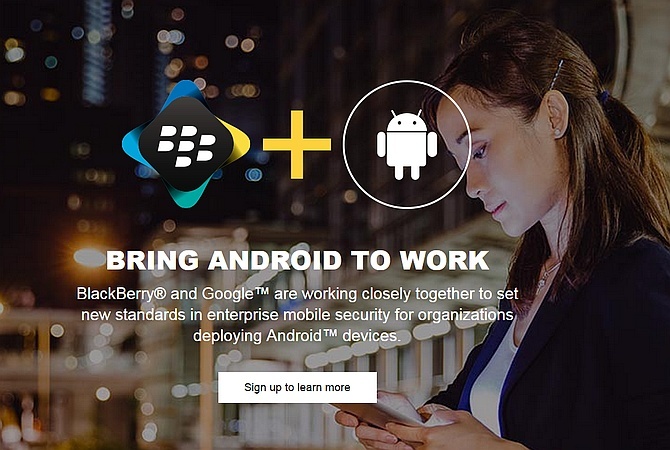 "Bring Android to work" is the headline of the webpage mentioned above, and the short description beneath says "BlackBerry and Google are working closely together to set new standards in enterprise mobile security for organizations deploying Android devices." Yesterday, BlackBerry also announced the Enterprise Service 12.2 update that offers multi-OS support and integrates Samsung KNOX and Android for Work. In addition to the above, BlackBerry Enterprise Service 12.2 integrates seamlessly with Android and allows the use of dedicated profiles for personal and corporate information. This update also supports the Apple Device Enrolment Program and integrates with BlackBerry Secure Connect Plus. These being said, it is only a matter of time now until BlackBerry announces their first Android handset and the set of unique security features that will probably come with it.